Judging by what we saw from time to time on Lake Ontario this summer I’m convinced there’s going to be more salmon in the Salmon River this fall than last year. In fact, they are stacked up good in front of the Salmon River right now and there’s as many as we’ve seen all year. This tells me there’s going to be a push of fish happening into the river very soon, if not today. While the congregation of fish staging is a sign there’s other factors leading us to believe this week will bring salmon into the rivers. We have a monstrous blow coming. We have major wind coming early this week. Wind here acts like a tide for us. It brings the fish in. This week, with the weather change and the rain, we should see some fish start to come in. I’m not looking for a massive push, but I’m expecting a decent push to get us started. There was a couple hundred salmon that came in around Labor Day, and a few here and there have been coming in, but we want to see 100s per day not dozens. By the end of the month I think the Salmon River will be have good numbers. On a positive note, when they come in later like this it goes later. We should have fish through October and into early November. On the other hand, I don’t believe our fish will be as large as they were last season. We don’t have a strong three-year-old class. A lot of our mature fish we are seeing are two-year-olds that are roughly 16-18 pounds. The older fish will be mid to upper 20s for sure. This week action will be centered on the lower river. If I’m fishing the lower Salmon River or the Salmon River in low water, like we have now, I do a lot of drifting with flies and where’s there’s room we drift small pieces of skein under floats. It can be pretty hard to run a float in salmon season because there are so many guys throwing over your lines. It’s extremely crowded up here. However, we are successful bottom bouncing with flies or eggs. If there’s significant water then I’m running larger pieces of skein in the deeper water. 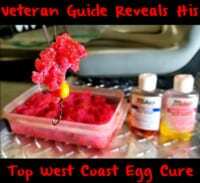 When it comes to egg cure I use the Pink or Natural Fire Cure. It’s the standard cure most of us use on the river. 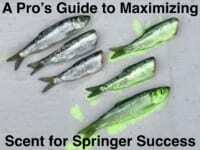 When the water is low and the fish are pressured I use more natural. I’m fishing my skein on two hooks: a Mustad 37132 octopus and Mustad Beak Bait Hooks. When using small pieces a size 6 to 8 is best. Meanwhile, for larger pieces I’ll go with a 2 to 6. I run all bait on Maxima 10-20 pound fluorocarbon. The size depends on conditions. I do my guided fishing from a drift boat. Consequently, if you’re going to fish from the bank, you’re better off going to the Douglaston Salmon Run (a popular pay to access area) because you have the freshest, unpressured fish. This is the bottom end of the river. Starting now you want to fish as low as possible, which is why this section will be popular. Then when we get more fish upriver anglers start to spread out. Once the fish move upriver, which can happen within a few days, the deeper, fast pools like the Paper Mill Hole, The Sportsman’s Hole and the School House Pool are popular spots that will produce. Editor’s Note: Veteran guide Troy Creasy operates High Adventure Sportfishing and is the editor of Lake Ontario Outdoors. For more info on his fall Salmon River salmon trips please visit http://www.highadventurefishing.com.